AJaay was gifted to arrange and compose Gospel music at the age of 12. He started out as a Drummer while attending Juilliard Richman High School, and worked as a Music Director for many choirs. While attending Queensborough College where he received a degree in Music Electronic Technology and Music Production, AJaay expanded his gift as a Music Engineer for SIR Studios. His role was to do live sound for various artists. Later, he became Minister of music and Vocal arranger for many church choirs. His duty was to prepare songs for four different choirs and teach vocal parts. In 2007, Ajaay started up his own production company named; Musicalsalad Productions. The name “Musicalsalad” symbolizes the diversity of Ajaay’s production. He specializes in gospel, jazz, hip hop, R&B and fusion. Ajaay released albums and produced music for different artist. He also has his own gospel recording group called Ajaay Swindell & Company. This group was birth in November of 2008. Their first album was called “Musical Conversation”. On June 2010, AJaay & Company released their second album and first live DVD recording entitled “AJaay & Company Live”. On august of 2011 Ajaay & Company released their third album titled, “I Owe It All To You”. This particular album has been nominated for an award for Urban Contemporary Album of the year by the Rhythm of Gospel Awards. They have traveled throughout the Metropolitan area spreading Gods word in song. They have opened up for various artist such as; Sunday’s Best Winner, Crystal Akin, Micah Stampley, Ricky Dillard and Yvette Williams. Ajaay was motivated by the Lord to carry the gospel all over the world. It is interesting to know how God converse and communicates His word through the lyrics of songs to deliver His messages. 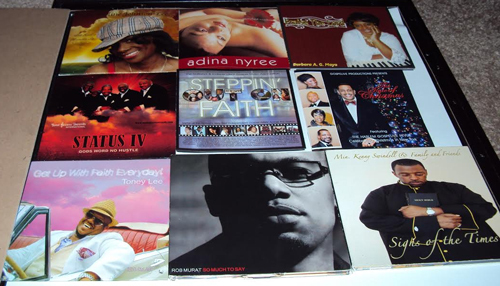 Ajaay has traveled through the International and USA playing the piano and drums for various artist such as; The Harlem Gospel Choir, Christopher Williams, Queen Esther and the Harlem Gospel Singers, Rob Morat and many more. He was also the musical director for the TV show; “Say What Karaoke” on MTV. Ajaay believes in giving his artist the best quality. His style of music is unique and pleasing to the ears of all listeners.